Imagine waking up in a cosy sleeping bag, on top of reindeer furs, in a frozen bedroom sculpted out of ice. 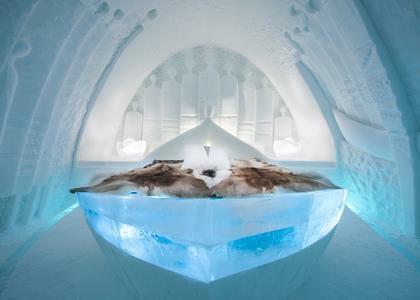 This will be your once-in-a-lifetime experience if you check into the world-famous Icehotel. Located in Jukkasjarvi, a peaceful village in Swedish Lapland, the Icehotel is 200km north of the Arctic Circle, where you're surrounded by stunning snow-covered fells and forests. 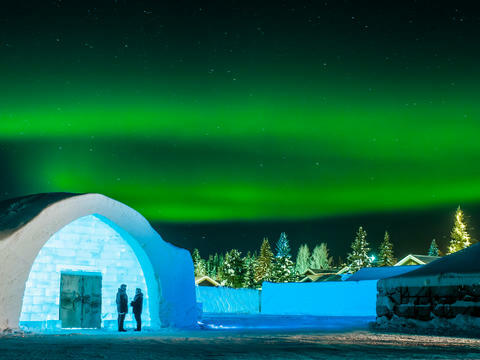 On our new three-night break, exclusive to readers, you'll spend one night in one of the Icehotel's classic Ice Rooms, one in their fully-heated chalet-style accommodation and one in Abisko National Park - rated by Lonely Planet as one of the best places in the world to experience the Northern Lights. 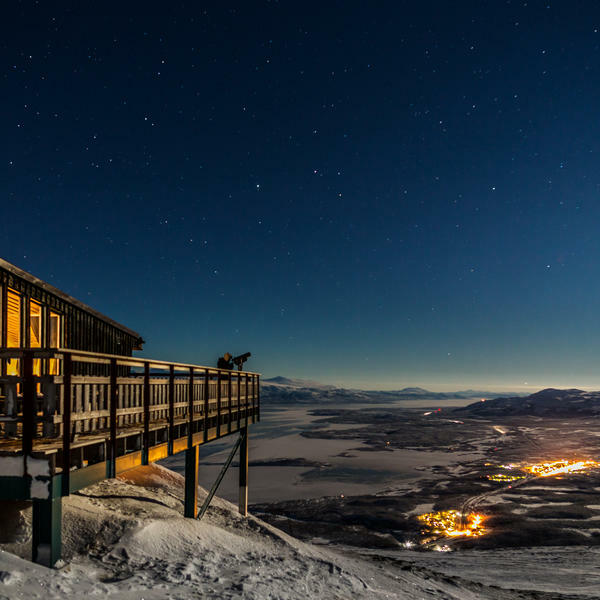 In Abisko, you'll stay at the Abisko Mountain Station, the only hotel in the national park, and enjoy a complimentary four-course traditional Swedish dinner in the cosy Aurora Sky Station. 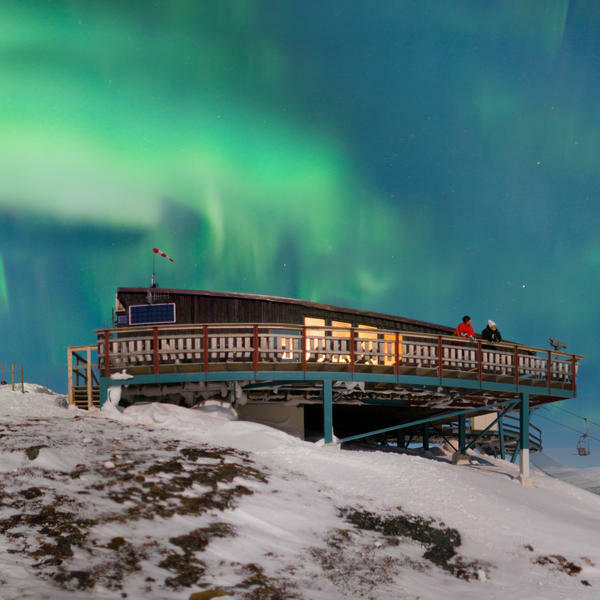 Look out across the Lapporten mountain valley at the vast Arctic skies to see if you can spot the supernatural light show while you dine. Prevailing winds here push clouds away, so the skies are almost always clear, and as there's virtually no light pollution, you're practically guaranteed a fantastic sighting just about every night between December and March, if the conditions in the upper atmosphere are right. We've partnered with Discover the World to offer you this wonderful short break, because they fly direct to Kiruna in just three and a half hours, instead of via Stockholm. Plus, readers who book for winter 2020 will get a free flight upgrade to Premium Class, worth £175pp** and a dinner upgrade worth £79* when booking before 30th April 2019. Services of a Discover the World representative. 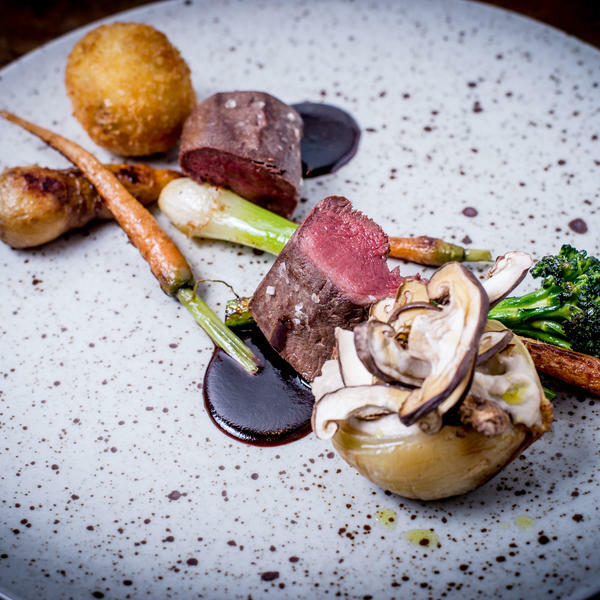 * *Flight upgrade worth £175pp, *dinner upgrade worth £79pp, excludes drinks. Offer available for bookings taken before 30 April. Price based on twin/double share travelling on select dates Dec 2019 and Jan-March 2020. Single supplement from £260. Arrive in Kiruna after your flight from UK, having enjoyed a meal with wine, beer or soft drinks on board your aircraft. From Kiruna, you'll transfer to the Abisko Mountain Station. 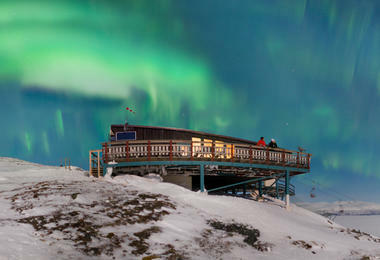 You'll take a short walk to the mountain base, where you'll be able to don some warm, cosy clothes to keep you snug on your 20-minute chairlift ride as you ascend to the Aurora Sky Station, and here you are invited to a four-course dinner. You'll also be able to learn about the fantastic phenomenon of the Northern Lights, and hopefully spend some time enjoying the Aurora yourself, before returning to the hotel to spend the night. After breakfast at the Abisko Mountain Station, you'll transfer to the Icehotel for a two-night stay (with one night spent in an Ice Room and another night in warm accommodation). Today you are free to explore, take in the spectacular sculptures in the Icehotel and enjoy one or more optional excursions, such as husky sledding. 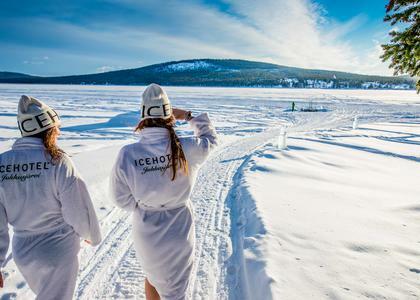 Spend another day at leisure at the wonderful Icehotel, taking part in the optional excursions or just soaking up the spectacular surroundings. The Arctic landscape here is unforgettable. Transfer to Kiruna today and say goodbye to the Arctic, ready for your flight back to the UK. You may expect it to be chilly lying on a bed made of ice - but when you’re wrapped inside an arctic sleeping bag and lying on a thick mattress covered with reindeer hides, you’re guaranteed to keep warm. With this exclusive offer, you will spend one night in an Iceroom and the other in the comfort of a traditionally-designed warm room. 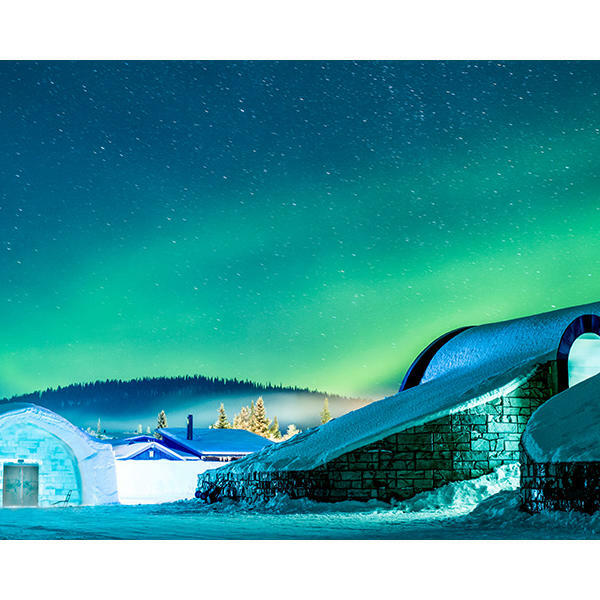 Located in Swedish Lapland, the seasonal Icehotel is rebuilt every year from the frozen water of the nearby Torne River. In summer, rising temperatures melt the hotel, returning the water to its source. 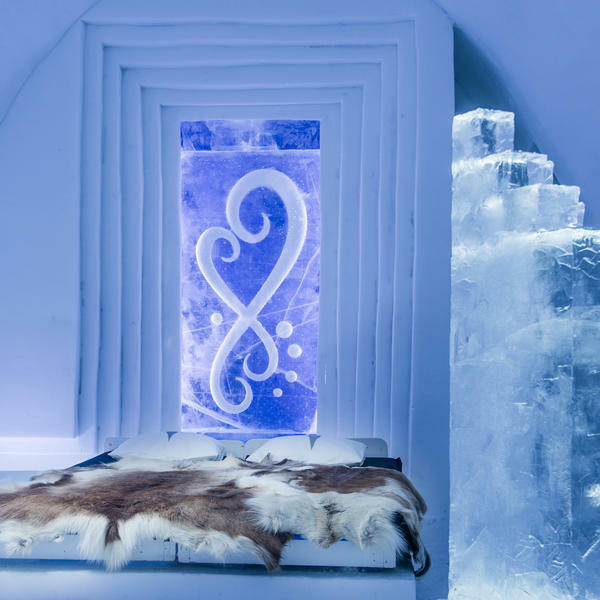 Close by, in the year-round Icehotel 365, you'll find a handful of luxurious Art Suites and Deluxe Suites - all of which are hand-sculpted from ice. It's like sleeping in a frozen work of art. 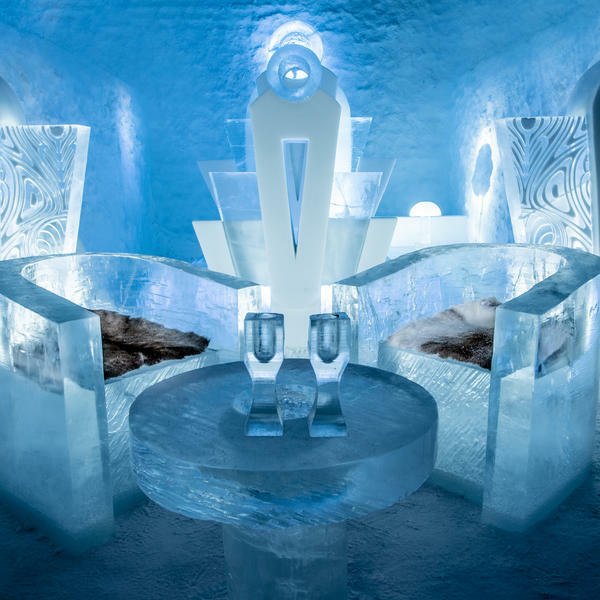 Over 200 artists apply to help sculpt the rooms and suites, which are created using a unique combination of ice and snow known as 'sn-ice.' Around 40 artists are selected, none of which are required to have worked with ice before. The designs are selected based on originality, meaning that no two suites are ever the same! There are two restaurants to choose from, as well as the famous Icebar, where guests are invited to mingle in the evenings. The warm accommodation comprises Scandinavian-style hotel rooms and wooden cabins. The Icerooms are furnished with frozen décor and a bed made of ice, made cosy by reindeer hides and a thermal sleeping bag. Held at a temperature of -5 to -8 degrees, each Ice Room is concealed behind a set of curtains. The warm building adjacent to the hotel houses the dressing room, with access to communal changing rooms, toilets and saunas. Guests can keep their luggage in the luggage storage room. All the Art Suites are individually-designed and sculpted by artists commissioned from around the world. 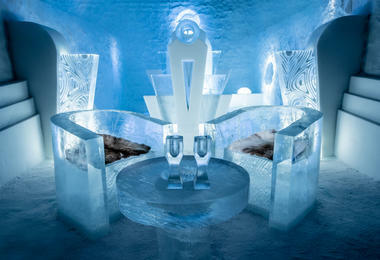 Art Suites can be found in both the Icehotel and permenant Icehotel365 and each one is completely unique. They are all held at a temperature of -5 to -8 degrees celsius and feature an ice bed covered in Arctic furs and a thermal sleeping bag. The warm building adjacent to the hotel houses the dressing room with communal changing rooms, toilets and saunas for men and women. Deluxe Suites are only available in the permanent Icehotel 365 structure and, like Art Suites, they are designed by artists commissioned from around the world. They are the largest of the suites, featuring a heated en suite bathroom and relaxation area (which provides storage for belongings). They come complete with Carpe Diem beds covered in reindeer hides and a thermal sleeping bag for warmth. Deluxe Suites are set at a temperature of -5 to -8 degrees celsius and are the only cold rooms that can be locked for privacy. Kaamos rooms are traditional in style with wood-panelled walls painted in calm shades of white brown and grey. These rooms are furnished with two beds, a desk and seating area with two armchairs and a small coffee table. The private en suite features a shower with a heated tiled floor. A TV, iron and board is also included. These wood-panelled apartments are wonderfully spacious and are equipped with a kitchenette and simple lounge area. Nordic Chalets sleep four people in two bedrooms, one with a double bed and one with a bunk bed. 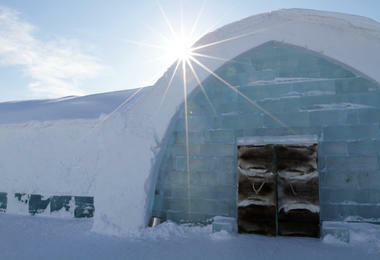 These are simple yet traditional apartments located between the Icehotel, reception and shop. They sleep three and come equipped with a master bedroom, a single bedroom, small lounge, kitchenette and bathroom. One of the UK’s leading tailor made destination specialists, Discover the World has been creating inspirational holidays for 35 years. To view Discover the World’s supplier’s terms and conditions click here.